The war between the Pandavas and Kauravas had become imminent and both sides had begun preparations. As allies were being made and battle lines drawn, both sides realised the importance of the support from the Yadavas. The Yadavas consisted of four major clans with their chieftains. They had been united under a single umbrella by Krishna as the Narayani Sena (the Narayani army, obviously named so because it is indeed Lord Narayana’s army). Duryodhana was keen to have the Yadavas fighting the war under the Kuru banner. So he decided to approach Krishna and seek His help. Much to his dismay, Arjuna from team Pandavas also comes there with the same objective. Arjuna is given first choice based on two considerations. 2. Arjuna is younger of the two. We are what we regularly do - Arjuna is humble while Duryodhana is arrogant. Arjuna chooses Krishna, much to the delight of Duryodhana, who walks away happily with the Narayani Sena while Arjuna walks away happily with Krishna. Both get what they desire. Ultimately, Arjuna is the winner for choosing God over everything else. The Pandavas are triumphant in the war and even the Yadava support isn’t enough to save the Kauravas from complete annihilation. When viewed from the Pandavas’ and Kauravas’ perspectives the above episode offers insights on making the right choice by choosing God alone. However, when seen from the Yadavas’ perspective, the episode seems to create massive confusion. For those that have been blessed to remain blissfully ignorant of this ‘confusion’, here is some stirring of a hornet’s nest! The Yadavas were an ancient Indian community that descended from the mighty emperor, Yadu. The community was formed of four major clans - Abhira, Andhaka, Vrishni, and Satvata - all who worshipped Krishna (as God or, at least, as a leader). It is difficult to say whether their love for Krishna preceded their love for Dharma or vice versa. However, this much can be said that they united under Krishna for they believed in His divinity and absolute adherence to Dharma. They knew that they could do no wrong by being on Krishna’s side. Now, when the greatest war of the Yuga was being fought between the forces of Dharma and Adharma (righteousness and unrighteousness), the Narayani Sena was being forced to fight on the side of Adharma (the Kauravas led by Duryodhana). For the first time in their lives possibly, the members of the Narayani Sena had to choose between obeying Krishna and fighting for Dharma! On the face of it, it appears as though the Yadavas trusted Krishna but Krishna misused their trust and commanded them to fight on the side of Adharma. While their God within, their conscience, was guiding them to fight for Dharma, their God outside was commanding them to fight for Adharma! The question now arises - which is the greater Dharma - following the conscience or following one’s duty as a soldier/devotee/follower? In other words, what should one do to ensure that the Karmic reaction is not adverse? Here is one way of understanding and answering it. Dharma and Karma are closely interlinked with one influencing the other. They are dynamically modified based on the thoughts, words and deeds of the individual. Thus, they get personalised for the individual and the situation. In other words, a single thought, word or deed cannot be painted as Dharmic or Adharmic on the standalone basis. A different time, place or circumstance (Desha, Kala, Paristiti) changes something Adharmic into Dharmic (and vice versa); bad Karma into good Karma (and vice versa). So, when we seek an answer to the question posed, we cannot do it by considering the Narayani Sena as a whole. Though the Narayani Sena has a Dharma and Karma of its own, the ‘group Karma’ does not free a member from his own ‘individual Karma’. The same holds good when we consider ‘group Dharma’ and ‘individual Dharma’. Let us look at it from both perspectives - ‘individual’ and ‘group’. It becomes impossible to take up the case of each member of the Narayani Sena. However, three representative cases give us a beautiful insight which resolves the confusion. These three heroes have been chosen because each of them responded in a different way to Krishna’s decision. Tracing their fate after their decision would make a good study. The first hero is Kritavarma. The son of Hŗidika, he was born in the fearless Andhaka clan. Going through the Vishnu Purana, one realizes that he was a great devotee of Lord Krishna. Yet, he takes charge of the entire Narayani Sena which is to fight under the Kaurava banner. He is known to be level-headed and strictly traditional; he is committed to Krishna and Dwarka. Since Krishna and Dwarka have committed the Narayani Sena to Hastinapura, he has absolutely no qualms in fighting for Duryodhana’s side. He and his men line up to Hastinapura. The second hero is Satyaki. The son of Satyaka, he was born in the Vrishni clan, the same as Krishna. He loved Krishna with all his heart and could not imagine taking up arms against Him. More so, he could not tolerate taking up arms for Adharma against his teacher, Arjuna. He is known to be hot-tempered and impulsive though he is noble at heart. 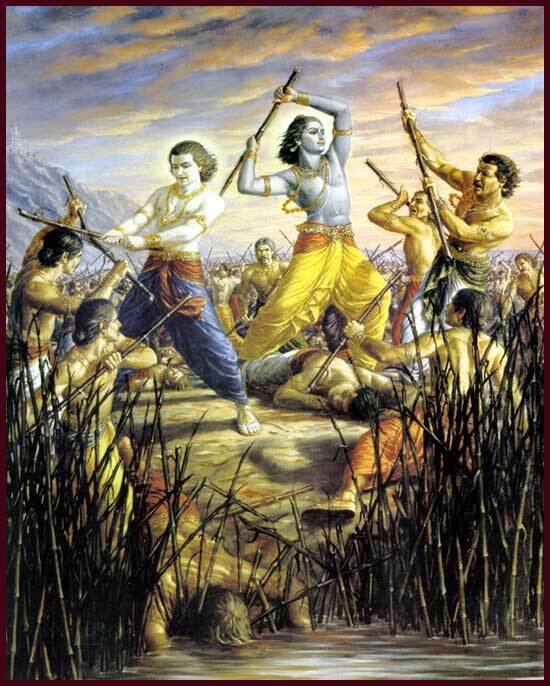 He disobeys his beloved Krishna and, with his men, fights the war on the side of the Pandavas. The third hero is Balarama. The elder brother of Krishna, he was the unnamed leader, second to Krishna among the Yadavas. His love for Krishna cannot be doubted in the least but his love for peace was great. His thought was that nothing justifies a war. And even if a war is inevitable, he did not want any part in it. He is a teacher to Duryodhana as well as Bheema in the art of wielding the mace and he is not happy with the thought of his favourite disciples fighting each other. Being a stickler for ethics and protocols, he refuses to fight for either side. He goes on a long pilgrimage seeking God and avoiding war. His men sit out of the war altogether. The Pandavas vanquish the Kauravas. The war takes a heavy toll and all the Kauravas are annihilated. We can see both in action - ‘group’ and ‘individual’ Karma. While the ‘group’ Karma of the Pandavas ensures them victory, it is not as if the Pandava army has not suffered extensive losses. In fact, the Upapandavas (sons of the Pandavas) are brutally butchered in their sleep! While the ‘group’ Karma of the Kauravas hands them a terrible defeat, it is not as if none of them have survived. Kripacharya, Ashwatthama, Yuyutsu and Vrishaketu make it safely through the war. Going into each individual history for those killed and those alive on the Pandava and Kaurava sides is beyond the scope of this discussion. But, what about the Narayani Sena in general or the three Yadava heroes in specific? During the war, Satyaki was the commander of one akshauhini (consisting of 21,870 chariots, 21,870 elephants, 65,610 cavalry and 1,09,350 infantry) in the Pandava army. He comes out of the war alive and kicking. Kritavarma was the commander of one akshauhini in the Kaurava army. He is among the few surviving heroes on the Kaurava side. Balarama returns from the pilgrimage and is, naturally, hale and hearty. The Yadavas do not lose a single stalwart in the war! Three contrasting decisions and yet, amazingly, it is the same result for Satyaki, Kritavarma and Balarama! The story does not end there. There is minimal loss in the Narayani Sena. Out of the 11 akshauhinis, only two participated in the war. 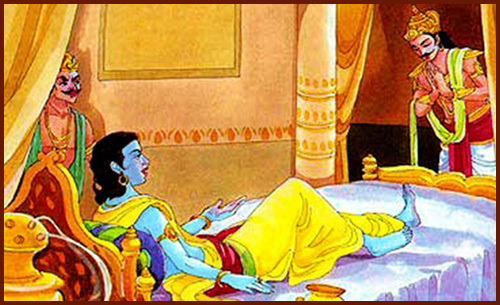 The one under Satyaki returned with minimal losses while the one under Kritavarma was mostly wiped out. Nine akshauhinis did not participate in the war (as advised by Balarama and, surprisingly, by Krishna too!) Thus, the Narayani Sena lost only about ten percent of its soldiers. It seems like justice has been done - mostly. The Yadava heroes are fine and ninety percent of the Narayani Sena is alive. However, the Narayani Sena came into existence not to ‘witness’ the war between Adharma and Dharma. Wasn’t it cheated out of the opportunity to fight for Dharma? That is the conclusion if we end the story with the Kurukshetra war. Continuing a little more, we see justice being served. When Yudhishtira performs the Ashwamedha Yajna after the war, to proclaim his emperorship over the whole of Bharatavarsha, it is the Narayani Sena that fights for him. The Pandava army has been greatly reduced in the war to vanquish Adharma. 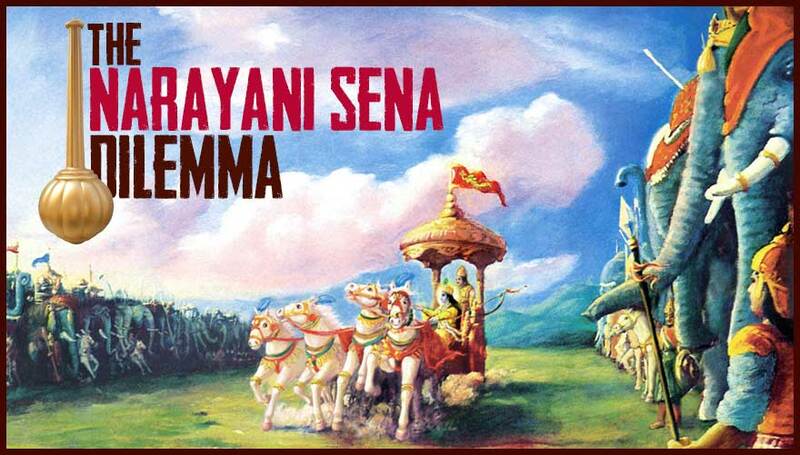 It is the Narayani Sena (Kritavarma include) that fights for the re-establishment of Dharma under Yudhishtira. So the men actually get what they had signed up for. But the one akshauhini that fought under Kritavarma seems to have been cheated out of its opportunity to fight for Dharma. The members of that akshauhini seem to be the unlucky ones with a bad fate. That is the conclusion if we end the story with the Ashwamedha Yajna. Continuing a little more, we get more clarity. The destruction of the Yadavas at Prabhasa - Krishna turns to be the 'creator', 'sustainer' and the 'destroyer' too! Isn't that what GOD stands for - Generator Organiser and Destroyer? Years after Yudhishtira is crowned emperor, the Yadavas become very powerful. Though the empire is peaceful and prosperous, the former members of the Narayani Sena become frivolous and hedonistic. Several dark omens strike, including the disappearance of the Sudarshana Chakra (Krishna’s weapon), the Panchajanya (Krishna's conch), Krishna's chariot and the plough weapon of Balarama. Pests multiply. Sinful acts multiply, yet no one feels any shame. Spouses deceive each other. Everyone starts to get terrifying dreams and nightmares. People insult and humiliate their seniors and teachers. When all this is happening, Krishna gets concerned and asks everyone to go on a pilgrimage to the sacred waters of the Prabhasa sea. Though the Yadavas obey, they reach Prabhasa and revel in merry making, dancing and drinking lots of alcohol. Arguments begin which turn into fights. In the fracas that follows, Kritavarma is killed by Satyaki in combat and Satyaki is murdered by several others seeking revenge. Soon, everyone is fighting everyone and at the end of a few hours, all except Krishna, Balarama, Vabhru and Daruka are dead! The Narayani Sena that was unrivalled in war and that established Dharma is now food for the scavenging beasts! Now it appears as though those members of the Narayani Sena who died in the war obeying Krishna’s command were luckier. They fought on Adharma’s side by the Lord’s command. Though they didn’t directly fight for Dharma, they did so indirectly. As many commentaries on the Mahabharatha go, had the Narayani Sena not fought for Duryodhana, he would not have had the courage to go to war. And had the war not taken place, Adharma could not have been completely wiped out. On the other hand, the so called ‘lucky’ members of the Narayani Sena turned immoral and Adharmic though they had signed up to fight for Dharma! They met a gruesome end - an end that nobody would ever want. That is the conclusion if we end the story here. And we shall end it here because we have received the necessary insights to answer the question posed in the beginning. Whether one follows the ‘external’ God or the ‘internal’ God (conscience), the result is the same. All it requires is for one to be absolutely truthful to oneself and have the courage not to compromise values at any cost. Sathya and Dharma are the greatest shields one can wield. Satyameva Jayate (Truth alone triumphs) and Dharmo Rakshati Rakshitaha Dharma Eva Hato Hanthi (One who protects Dharma is protected by Dharma; one who destroys Dharma is destroyed by Dharma). In the end, there is justice always. If justice has not been served, it is not yet the end!